It's the question that's been on everyone's lips ever since our Samsung Galaxy S4 review landed - can this latest flagship make it a hat trick of appearances at number one for the Korean manufacturer? The results are now in and we can officially reveal that the HTC One has managed to beat off intense competition from the Galaxy S4 to stay in top place in our 20 best mobiles phones in the world today showdown. It was probably the most difficult call we've had to make in the history of the top 20, with very little to choose between the two - if only we could use the Robot Wars judging methodology of style, control, damage and aggression. The HTC One offers power, poise and beauty and it's this innovative package which has seen it trump the still excellent - but noticeably plastic - Galaxy S4. 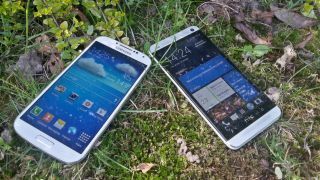 With the arrival of the Galaxy S4 the Samsung Galaxy S3 has taken a tumble down the rankings to seventh, while the Sony Xperia Z still holds firm in third, closely pursued by the iPhone 5 and Nexus 4. The ball is now firmly in Apple's court as we wait and see if the rumoured iPhone 5S (or could that be the iPhone 6?) can take top spot later this year - unless Google springs a surprise at its IO event in a couple of weeks.